The Society for Veterinary Medical Ethics has posthumously honored Franklin M. Loew, DVM, PhD, former dean of Tufts’ veterinary school, with its 2011 Robert Shomer Award at the AVMA Convention in St. Louis in recognition of his significant contributions to veterinary medical ethics. Dr. Loew became dean of the now-named Cummings School of Veterinary Medicine in 1983, when the school was a mere three years old. During his 13-year tenure, Loew built the veterinary school into a nationally recognized institution which now has graduated more than 2,000 veterinarians—many of them pioneers in their own right. While at Tufts, he established an ethics curriculum that now spans all four years of the school’s Doctor of Veterinary Medicine program: Human-Animal Relationships in the first year, Jurisprudence in the second, Ethics and Veterinary Medicine in the third, and a capstone, small-group colloquium in the final year. 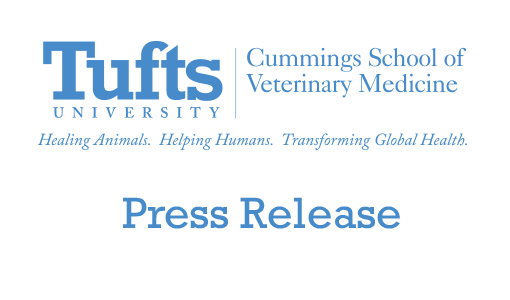 During his tenure, Dr. Loew also established an Ethics and Values signature program at Tufts, as well as the school’s Center for Animals and Public Policy, an academic center dedicated to understanding the role of animals in the community, the environment, and research. Upon its founding in 1983, the center was the first of its kind. The Robert Shomer Award has been given to only four other pioneers in the veterinary field who have led distinguished careers as leaders in the field of veterinary medical ethics through scholarship, advocacy, or mentorship. Dr. Loew’s plaque will be displayed in the Franklin M. Loew Veterinary Education Center, which houses a lecture hall and the Cummings School’s veterinary library. Dean Loew’s commitment to animal welfare and veterinary ethics distinguished him as a scholar, an educator and an advocate. 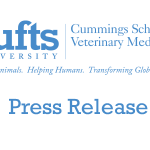 He was recognized for his vision and eloquence and for elevating our understanding of human-animal relationships, said Deborah T. Kochevar, DVM, PhD, dean of the Cummings School. The Center for Animals and Public Policy that Dean Loew created at Tufts engages a spectrum of students and scholars and promotes principles of active citizenship that benefit all. We are honored to preserve Dean Loew’s legacy and to accept this special award, presented by the Society for Veterinary Medical Ethics, on his behalf. Dr. Loew, who died in 2003, also served as dean of his alma mater, Cornell University’s College of Veterinary Medicine, as well as president of Becker College in Worcester, MA. Frank was a great man, a visionary; he was twenty years ahead of his time in urging veterinarians to take animal welfare seriously, said Jerrold Tannenbaum, MA, JD, a professor of Animal and Veterinary Ethics and Law at the University of California at Davis School of Veterinary Medicine, in his nomination of Dr. Loew. Tannenbaum taught veterinary ethics at Tufts during Loew’s tenure as dean and is a previous winner of the Shomer Award. I can tell you from first-hand experience that there has been no one who has believed more strongly in the importance of ethics in the professional role of veterinarians and in the activities of all who interact with animals. Tannenbaum’s comments were echoed in another nomination of Dr. Loew filed by fellow Shomer Award winner and the other founder of Tufts’ ethics curriculum, Andrew Rowan, PhD. Rowan is now Chief Scientific Officer at The Humane Society of the U.S. and Chief Executive Officer of Humane Society International. Dr. Loew held two doctorates, one in nutrition from Canada’s University of Saskatchewan and one in veterinary medicine from Cornell University, where he also received his undergraduate degree. He was an elected member of the National Academy of Science’s Institute of Medicine. He also was a division director at Johns Hopkins School of Medicine and a professor at the University of Saskatchewan, where he was also a Medical Research Council Fellow. He was also a visiting scientist at MIT and a senior fellow at Tufts. In the 1970s, Loew was on the research team in western Canada that helped develop what is now known as canola oil. In 1977, he received a Queen’s Jubilee Medal from the Governor-General of Canada. Loew served as a consultant to many universities, foundations, government agencies and companies, including Columbia and Ohio State universities, the Howard Hughes Medical Institute, the Pew Charitable Trusts, the Food and Drug Administration, the National Institutes of Health, NASA, the Smithsonian Institution and the US Department of Agriculture. He was also a member of several nonprofit boards of trustees, including the New England Aquarium and the Tuskegee Advisory Committee for the Center of Bioethics and Health Care Policy. His writings appeared in publications ranging from Science, Nature Biotechnology and all the major veterinary journals to The New York Times and The Wall Street Journal. His book, Vet in the Saddle, was published in 1978.